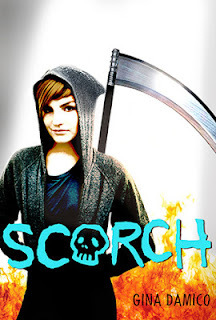 Sixteen-year-old Lex Bartleby is a teenage grim reaper with the bizarre ability to Damn souls. That makes her pretty scary, even to fellow Grims. But now Lex is a pariah in Croak, the little town she calls home. To escape the townspeople’s wrath, she and her friends embark on a wild road trip to DeMyse. Though this sparkling desert oasis is full of luxuries and amusements, it feels like a prison to Lex. Her best chance at escape would be to stop all the senseless violence that she caused—but how can she do that from DeMyse, where the Grims seem mysteriously oblivious to the bloodshed? This book didn't really have the feel of being a second novel in the beginning. But once you hit the cliffhanger ending, you realize you've been strung all along into the typical second novel. That was one issue for me. My other issue was I had forgotten what happened in Croak, and this book didn't make it easy for me to remember. We have the same witty characters you learned to love in Croak: Lex, Driggs, Uncle Mort, etc. But the town's afraid and starts to revolt against them. It's kind of a adults-against-teens fight, which I also didn't care for. But we still see the same dark humor and sarcasm that we saw in the first book. The only difference is they're constantly running away from the fight in this book. Don't get me wrong, things do happen in this novel. But for every little explanation you got, more questions came up. And they finally stopped running towards the end, and what I thought was the real story came out. But there was only twenty pages left which told me to expect the cliffhanger. It still stunk though. Mixed emotions on this one. Unfortunately, my sister didn't like this. We both loved the first book so it's disappointing to see bad reviews, although you said you had mixed emotions. Great review!